As National Express West Midlands prepares to unveil new buses during 2015, they will be accompanied by revisions to liveries. 175 new bus include Alexander Dennis Enviro400 (MMC) as the chosen double-deck type and will feature a two-tone red livery with yellow relief. However, 58 of these will have a grey livery for new premium quality 'Platinum' services. By coincidence as 2014 closed the last of the buses in the blue, grey, white and red livery were going through the paint shop and re-appearing in the current red and white livery. Several miles north of the West Midlands territory, Burton-upon-Trent is the focus of the team with the latest set of images added to the albums. Arriva, Midland Classic and Trent all operate services in and around the town and provide a variety of vehicle types and design. 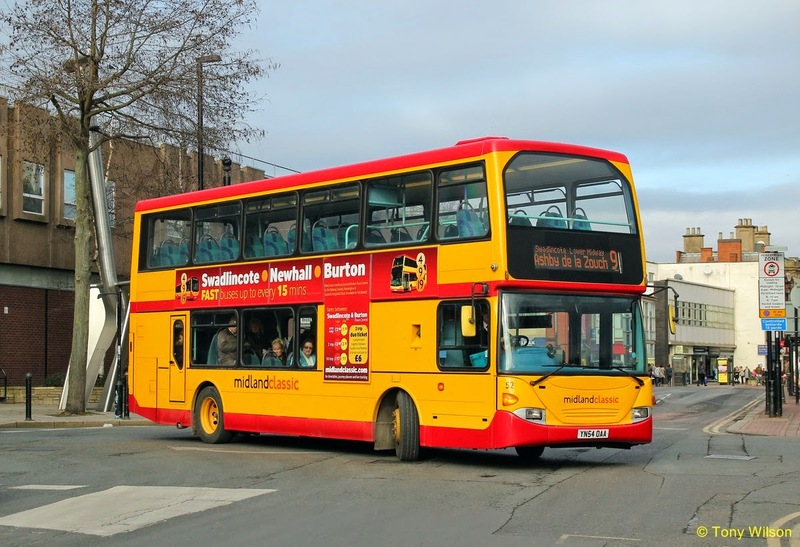 Whilst Arriva and Trent use buses mostly acquired from new, Midland Classic's fleet is in the main second-hand, but that is not to say they are any the less well maintained mechanically and perhaps moreso visually. The red and yellow livery does add some brightness to the surroundings.